What’s Happening in Your Brain While You’re Tapping? When you use the Faster EFT process, the effects are not just “in your mind”. Physical changes happen in your brain as you use the technique. It literally changes the structure of the neocortex of your brain as old connections are replaced by new. As you use the FasterEFT technique on an ongoing basis, you are changing the neural connections in your brain – which will result in an automatic change to the way you think. And thinking differently will naturally change the results you experience in your life. The neocortex is the outer part of the brain – the walnut-shaped part that we all recognize as the brain. When you have a thought, a connection is made in this part of the brain between nerve cells or neurons. Every thought is a connection. Thinking the same thought over and over creates a more permanent connection between those particular neurons. This is how we learn intellectually. When a particular neural pathway is no longer being used, the connection begins to atrophy and those neurons no longer fire together. This is how we forget information. The connection in the neocortex triggers the limbic brain (chemical brain) – which is positioned underneath the neocortex – to produce chemicals that cause a sensation, a feeling, that matches the thought. 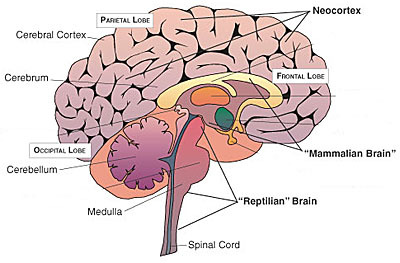 With repetition, the combination of the neural pathway becoming more permanent and the limbic brain producing the matching chemicals causes the cerebellum (the reptilian brain) – the seat of the subconscious – to record the response. This is the reason you’re able to drive home for 30 minutes and not remember the journey. Your cerebellum is doing the driving. It’s also the reason you react automatically with no conscious decision when someone “pushes your buttons”. So, What’s it Got to Do with FasterEFT? When you use the FasterEFT process, you are addressing the original records in the subconscious, and making changes to them. For more detail on this, read: The REAL Cause of All Your Problems. As you do this, you are literally rewiring the circuitry in your neocortex. Those permanent connections that provide the structure for the old way of thinking are rearranged and new connections are made. The records your subconscious is now referring to are providing different “proof” of your truth and reality. This means the subconscious is prompting your brain to trigger different responses in your body – different neuropeptides, different chemicals that cause different reactions. These are now based on the new records you’ve installed using FasterEFT. The sensations caused by these chemicals prompt the conscious mind to think thoughts that match, explain and support these feelings. 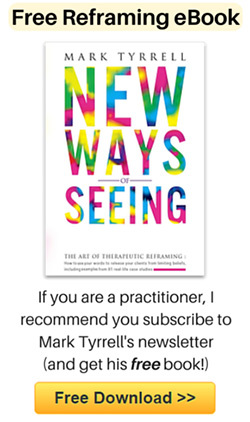 The new thoughts caused by the new feelings form new connections in the neocortex of your brain. The old connections are dismantled as they are no longer being used; and the new connections are “wired” more permanently as you continue with the new responses. These new responses are the result of your subconscious prompting your brain to trigger your body – based on the new records. You have literally rewired your brain; and your new thinking now happens automatically as a result. You will find yourself making decisions you’d never have made in the past. You’ll notice that you’re solving problems in a different way; seeing different opportunities; looking at things from a different perspective; able to notice things you’ve never noticed before – all because your brain is now wired differently. Using Faster EFT causes a biological, neurological restructuring of the system that causes your instinctive, natural, automatic behaviors, choices and perspectives. And this, of course, means you experience different results. Click Here to Visit Robert Smith's Brand New Website. For more information on how and why Faster EFT works visit The FasterEFT Belief System. To find out how to use FasterEFT read blog: The FasterEFT Technique – Step-by-Step. To see FasterEFT in action, watch the videos in the FasterEFT in Action Playlist. 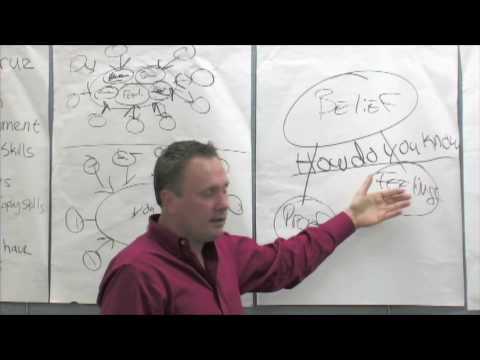 There are currently over 1,300 Free Video's on Robert Smith's YouTube Channel Healing Magic on almost every Problem/Illness you can think of. If you feel that FasterEFT has helped you in any way, please feel free to share this with your Family/Friends (Sharing is Caring). If you would like to get involved in this Amazing Healing Modality and Help Other People Across the Globe then why not Consider becoming a Faster EFT Practitioner by taking the FasterEFT Ultimate Training Course and Recieve Your FasterEFT Practitioner Certificate. More Info Here and Here. Click Here to Visit Robert G Smith's Official Website.